Mystic assassins bent on revenge for a crime Christopher never committed. A witch growing in power and hatred. Christopher Sawyer never wanted to be Hell’s bounty hunter, he was probably the least qualified person for the job. It had to be a mistake. But now he must master the power of the Book and Blade and become the Hunter of Lost Souls tracking down dark souls escaped from Hell. But when a new enemy rises from ancient Egypt bent on revenge against the Hunter of Lost Souls for a crime he never committed, Christopher quickly discovers the limitation of his vast power. And they are planning a fate for him much worse than death. Back home in New York, a young witch under the tutelage of the most powerful Dark Soul Christopher has ever encountered is learning to use her evil power in creative and terrifying new ways. With the help of a New York detective and a computer whiz, the Hunter must find a way to stop both new threats before it is too late. 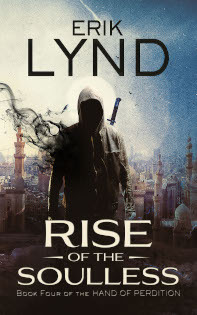 Rise of the Soulless is the fourth book in the urban fantasy series, The Hand of Perdition. If you like fast-paced urban fantasy, epic fights, dark supernatural creatures bent on taking over the world, you will love this series from Erik Lynd.